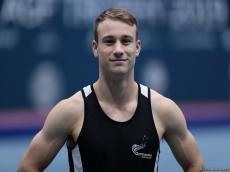 Conditions created in Baku’s National Gymnastics Arena are excellent, New Zealand trampolinist Dylan Schmidt told Trend. “It is my first time coming to Azerbaijan and my first time in this venue. I’m enjoying it. It’s been a while since I’ve been in this environment and it is a very nice space,” the gymnast said. Schmidt further noted that training is going well, adding that now he is recovering from the injury. “I’m feeling pretty good. I haven’t competed over a year. I had a serious injury last year, which put me out of action,” he stressed. He also said that he has walked around the city. “It was nice, despite the fact that it was cold,” Schmidt pointed out. The World Cup in Trampoline and Tumbling will be held Feb. 16-17 in Baku. Such athletes as Vladislav Goncharov, Rosanna MacLennan, Jason Burnett, Dong Dong, Lei Gao, Dmitry Ushakov and Bryony Page will compete in this World Cup. Veronika Zemlianaia, Ruslan Agamirov, Ilya Grishunin, Oleg Piunov and Mikhail Malkin will represent Azerbaijan at the World Cup. Eight FIG World Cups in Trampoline will be held in 2019 and 2020 and two of these will be held in Baku. Baku hosted the European Championship in Trampoline in 2018. Representatives from 26 countries participated in the championship. Trampoline world cups were organized in 2016 and 2017.